Jonnie produced public service drama, documentary and digital media for over 30 years from the West Midlands. He founded Maverick Television, one of the UK’s leading independent production companies with bases in Birmingham, Los Angeles and London. Maverick joined All3Media in 2007. Throughout his career he has contributed to the development and delivery of policy across the cultural, education and creative industries. He is Chair of Midlands Arts Centre and Director of Creative England; The Space; and Birmingham Creative City Partnership. He is a founding Trustee and Vice-Chair of Birmingham Ormiston Academy; and Employment and Skills Champion on the Greater Birmingham and Solihull LEP. He is an honorary Fellow of Warwick University; Doctor of Arts Wolverhampton and Coventry Universities; and was Artist in Residence 2015/16 at Birmingham City University. 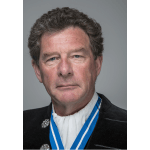 In 2015/16 Jonnie was High Sheriff of the West Midlands with a theme of arts, creativity, young people and the law. In 2010 Jonnie was awarded an MBE for services to International Trade.